Maechee Dara Janloi ordained at the age of 21, and for the past 32 years has served the Buddha Dhamma. An expert in social work and offering Dhamma teachings, she has helped women incarcerated in prisons, the elderly, those near death in hospitals, and the poor in remote mountainous areas. She has empowered teachers, nurses, medical doctors, police officers, factory workers, soldiers, and office workers. Her outreach has also assisted families in need of counseling and orphans living in government dormitories. Teenagers across northern Thailand have benefitted from her Dhamma teachings offered at high schools as well. 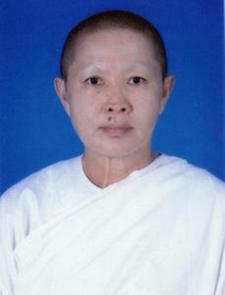 She is a committee member of Lotus Foundation; President of Love Line Family Center #82; radio Dhamma teacher on White Wave stations 75, 88, 104, 106; project member of Leaves Held in One’s Hand. She goes everywhere and thinks of herself as a glass half-filled so that she can receive what others want to share. She receives inspiration from her parents, spiritual teachers, and from her life experiences. She gains happiness from giving to others.